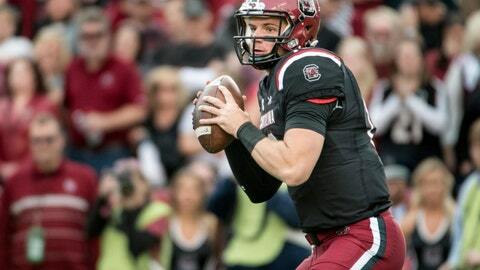 COLUMBIA, S.C. (AP) — South Carolina quarterbacks coach Dan Werner keeps searching for flaws, shortcomings or things to fix with Gamecocks starter Jake Bentley. So far, the long-time coach hasn’t found anything to complain about — yet. “There are no negatives,” said Werner, in his first year at South Carolina. “He comes to work every day wanting to be a leader, wanting to work hard, just begging for information. He’s always the first one there, the last one to leave. Bentley’s done that reasonably well since taking the starting job two years ago in the middle of coach Will Muschamp’s struggling first season. Bentley, a 6-foot-4 junior, was scheduled for a redshirt season. Instead, he was pulled into the middle of the things in 2016 and helped the Gamecocks qualify for a bowl game after a 2-4 start. He started every game last fall as the Gamecocks went 9-4 , their most wins since earning 11 victories in 2013. Bentley, though, has struggled at times with his accuracy and production . His 12 interceptions last year were second most in the Southeastern Conference to Missouri’s Drew Lock and Bentley was not among the top 10 in SEC pass efficiency ratings. So Bentley, along with Werner and graduate assistant Taylor Lamb, got to work. Werner has concentrated on Bentley’s footwork and balance as the Gamecocks try and speed up an offense and was 12th out of 14 SEC teams last year. That’s even more of a premium, Werner said, since Bentley must make decisions more quickly in the run-pass option attack — one that naturally makes players off balance because of its intricacies. “He’s gotten so much better,” Werner said. The return of big-play receiver Deebo Samuel helps. Samuel had six touchdowns in three games (three receiving, one rushing, two on kick returns) before breaking a bone in his leg and missing the final 10 games. Bentley said he and Samuel have worked this summer to cement the on-field relationship that tantalized fans before the injury. “We think we have something special here, mindset wise,” Bentley said. Bentley has spent the offseason watching film of some of the NFL’s best in Drew Brees, Tom Brady and Aaron Rodgers. Werner cut up film of Bentley throwing alongside clips of the pros making similar throws. Bentley also understands the opportunities that lay ahead with a stellar year. Several online outlets have Bentley as a high-round draft pick, potentially as high as the first round. The quarterback has heard the talk — and mostly brushed it aside. Muschamp said his teammates said it best about Bentley’s single-mindedness when they voted him captain last fall. “To be only one of three young men in South Carolina’s history to be named team captain by his teammates his sophomore year to me says an awful lot about the respect and the leadership and ability he has,” Muschamp said. Bentley believes the time he’s put in to improve his game will show out when the season starts.